Waterproof MP3 Players, Waterproof iPod Cases, Waterproof Headphones, Waterproof Phone Cases & Waterproof Radios For Swimming to Music. The largest range of waterproof MP3 players and cases available in one store. We are a trusted authority on selecting the best product for use during watersports activities, especially swimming. Please call us for advice. We provide honest advice about our products and the manufacturers that support them. We always try our best to get you a quick refund or replacement of any goods that prove faulty under their warranty. 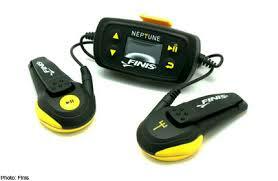 As of May 2013, the latest model in the SwiMP3 range is the Finis Neptune with digital track display. The 3-piece design has 2 side speakers and a digital screen that sits on the back of the head. The screen shows the song, artist and play status for each use. The Finis Neptune replaced the older SwiMP3 2G and is our first choice for swimming, simply for its ease of use and great sound underwater due to its use of cheek bone conduction pads. When using the Finis Neptune in the swimming pool there is no need to fiddle with ear buds. Its the probably the best waterproof MP3 player for swimming and is designed by an olympic champion swimmer for swim training. In 2013 we also introduce a new waterproof mp3 player to our range in the form of the UWaterG4. This is the worlds smallest MP3 Player. It comes with a recently updated 3.5 pin headphones jack as of Nov 2012 and can now be used with all of our standard waterproof heaphones. For 2014 are offering the UwaterK8 the worlds smallest yet smartest mp3 player radio for swimming. Its 8 Gbyte of storage means that this little waterproof mp3 player allows you to upload up to 2400 songs or 20 audio books. 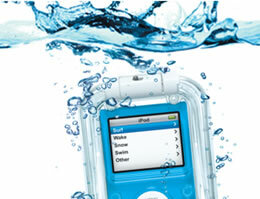 Some of best quality waterproof iPod cases available on the market come from H20 Audio. We also offer Aquapac and Overboard soft cases that fit many MP3 players including all of the various iPod models. Our waterproof headphones fit all standard MP3 player audio jacks & waterproof MP3 cases. Our latest edition to our headphone range in 2013 are the X1 Surge Mini headphones. In 2013 one of our suppliers H2O Audio rebranded itself as X1. For a waterproof iPhone solution we offer waterproof phone cases from X1 (H2O Audio) and Aquapac. In our experience these companies offer the most reliable waterproof phone cases. Since 2011 Aquapac have been offering a 5 year UK warranty on their cases and as a result their our first choice to keep your iPod, iPhone or iPad dry. In 2009 H20 Audio brought out the original interval-waterproof headphone system for a waterproof iPod shuffle second generation which attaches to your swimming goggle straps. Later in 2010 the Waterproof iPod Shuffle 3G interval waterproof headphone system was introduced. In 2011 the Waterproof iPod Shuffle 4G interval waterproof headphone system was brought out and works with the 4th generation iPod shuffle & attaches to your swimming goggle straps. The Speedo Aquabeat 2.0 is a good choice for a waterproof radio for swimming, due to its handy clip that allows it to fix the unit to your swim costume or goggles. However you also have the choice of the Nu Dolphin Touch waterproof MP3 player radio to consider when swimming. Also the UwaterK7 & UwaterK8 offer waterproof radios designed for swimming. A new product for 2011 is the XSories Aquanote waterproof MP3 player was designed for a multi use watersports enviroment. It is great choice for triathlons due to its headband design. Finally the Waterproof iPad Cases from Aquapac and Overboard offer a great choice for protection of your PC tablets when down the beach or at the pool. Released in May 2013 the new Finis Neptune waterproof MP3 player comes with 4 Gbyte of memory allows you to listen to 60 hours of your own music whilst swimming. It is designed to be used with all swimming strokes but gives the best sound quality with front crawl & backstroke when the cheek pads are submerged in water. It can be used with the majority of swimming goggles. H20 Audio specialize in the manufacture of high quality hard & soft waterproof iPod cases. These cases allow you to use your iPod Nano, iPod Classic, iPod Touch, iPod Video & Apple iPhone underwater. These cases must be used only with H20 Audio waterproof headphones.